Leprosy, an age old disease closely associated with biblical times, has not gone away. 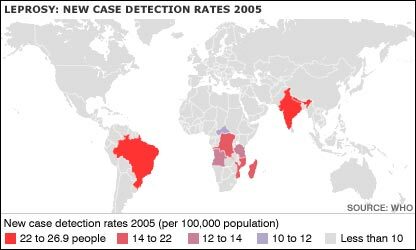 In fact, about 500,000 new cases - more than 1,400 people every day - were diagnosed in 2005. In 1996 the World Health Organisation said it hoped to all but eliminate the disease within 10 years. But in 2006 people in South America, Asia and Africa are still living with this debilitating illness even though a cure, which is available for free, was found more than 20 years ago. It is hard to pinpoint why it is taking so long to eradicate an illness that has not been found in Europe for decades. Tim Lewis, a doctor working in Nepal for the Leprosy Mission International thinks the continued stigma surrounding the disease could be to blame. He said: "There is definitely still a stigma surrounding leprosy. We are still seeing some patients coming at quite an advanced stage of disease and the main reason why people delay treatment is still fear of rejection." "We had one case where a man with the disease lived with his family, but they drew a line down the centre of the house and told him to stay on his side. His food was then passed over the line." June Nash, a missionary for more than 30 years, has also witnessed first hand the shame a leprosy diagnosis can induce. She recalled the story of one patient from Africa who thought she would have to get a divorce after being diagnosed. She said: "The patient was cured of the disease and didn't have any disabilities but was convinced she would have to leave her husband just because of the shame." Daniel Izzett, a pastor in Zimbabwe, began losing the feeling in his fingers when he was a child but was not treated for the illness until he was 24. He told his immediate family but admits delaying telling anyone else because he feared their reaction. "I was almost living in denial but it was 10 years before I was told I had leprosy after being continually misdiagnosed. "I told my family and my bosses at work because I needed time off for treatment but generally we kept it a great secret because of the stigma. It seems an unwritten law in society - fear of leprosy." Most of the worries surrounding leprosy may stem from the fact that it is probably spread by airborne infection such as coughing and sneezing. The first outward sign is a patch on the skin, usually associated with loss of feeling around that area. However, it is now thought that 95% of people are naturally immune to the leprosy bacteria and once a patient begins treatment they are no longer infectious. Multi drug therapy also cures most victims but physical deformities, including damaged hands and feet, remain. This may make it hard for family and friends to accept sufferers. Another factor which could have added to leprosy's doomed reputation includes the once prevalent 'solution' of transporting sufferers to leper colonies, also known as Leprosaria, which were often located on remote islands. Transferring patients to these far-away places added to the mythology that the disease was 'dangerous' according to Ms Nash. "The health profession certainly did not help early-on because removing these people from society simply reinforced the misconceptions," she said. Most colonies were closed in the 1960s, when drug treatments began to advance, but in Japan the last one remained open until 1996. A government panel which reported on Japan's health policy towards lepers in 2005 also found that for a period of 30 years, up to at least the 1950s, the babies of hundreds of patients were deliberately killed by medical staff. Some colonies are still operating in Eastern Europe and India mainly because sufferers are now used to living cut-off from society and feel safer in these controlled environments. Tackling long held worries about rejection and shame seems key to overcoming the illness in the long term because the sooner people are treated the less likely they are to become seriously disabled. Pastor Izzett thinks the attitude is changing. He said: "My family kept it secret for 28 years before going public but when I told the church where I am the pastor no-one rejected us. In fact most of the remarks were 'why didn't you tell us before?'." The WHO's desire to eliminate leprosy may eventually be achievable within a few years but the fight is far from over. Julie Lewis, another missionary in Nepal, thinks tackling poverty on a global level would be a start. "If you raised the living conditions of everybody in the world leprosy would automatically disappear. It disappeared from Europe before a treatment was available just because people's living conditions improved," she said. And in the meantime education and awareness needs to continue if a world without leprosy, a disease as old as mankind, is ever going to exist.